Yummy, in fact! 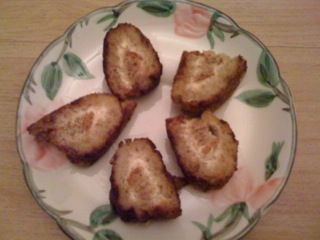 I had some cream cheese that needed using, and had been craving cinnamon toast-in LA toasts are the new cupcake, by the way-so I decided to make these Mini Cinnamons from “Texas Cook Book” from Golden West Publishers’ Cooking Across America Cookbook Collection. Now, there is nothing particularly Texan about these little delights, but I like em’ just the same. Which is too friggin’ bad since I used the last of my organic fingerling potatoes to make them. The recipe? Buttermilk scalloped potatoes from a super old school vegetarian cookbook: Laurel’s Kitchen. That’s what I get for foresaking Bittman again, perhaps. I mean, the potatoes weren’t bad, but they needed a heck of a lot of salt. I am not even gonna leave the recipe cause it’s not worth making in my book unless you happen to be a huge buttermilk fan. Which if you are I am tickled. That’s sort of adorable. 3/4 lb taters, cut into edible bites, boiled til tender. 6 Tbsp. 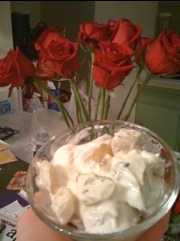 Cream cheese, 1/4 cup of half in half melted in a small saucepan. Then whisk in 1/2 a tablespoon of fresh squeezed lemon juice, plus salt and pepper to taste. 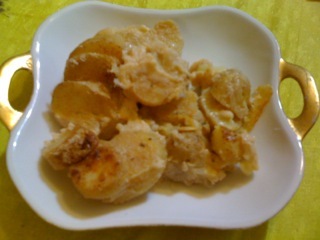 Fold in taters with 2 Tbsp. of chives. Chill. Both the potato salad and you, if you’ve got leisure time. Me, I ran off to acting class while the salad chilled. I managed to cook from this February’s Bon Appetit, while on the phone and multi-tasking AND remembered to add the thyme called for in the recipe. BOO-YAH! 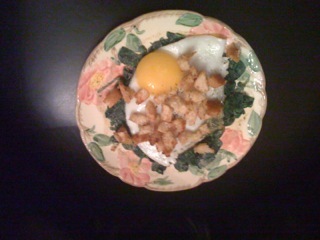 and the Sunnyside Up Eggs with Mustard Creamed Spinach and Crispy Crumbs were fantabulous. I used olive oil spray instead of straight up oil(cause I hate even a remote sensation of grease on my lips), dried thyme instead of fresh, and baby spinach instead of regular. And halved the recipe since my significant other was not around for me to prepare this as a romantic dish for two, the way Bon Appetit suggests. He was missing out though, this was way yummy. And cute. 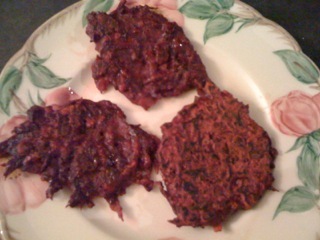 Ok, this week I really had no business trying to find time and concentration to follow recipes and/or blog but I did:) This time around, the variation on Bittman’s Vegetable Pancakes. From How to Cook Everything Vegetarian, mais oui(can you tell I am studying French? another thing I shouldn’t have time for). Anywho. CSA gave me beets, and the recipe had a variation which called for using beets for the 2 cups of shredded veggies, and you were also supposed to add time. I mean thyme. But added time would have been helpful too. I was rushing, trying to return phonecalls and cook simultaneously. D’oh! No time for the thyme. But they still tasted nummy. Oh, and I substituted whole wheat for regular flour. And melted Smart Balance for melted butter. So essentially, 2 cups of shredded beets, 1/2 of an onion, grated, one cup of whole wheat flour, some S & P, an egg, and milk to make a thick batter. Then 2 tbsp. of melted smart balance. Mix it up and cook on a griddle! Nutritious and delicious. And gorgeous!